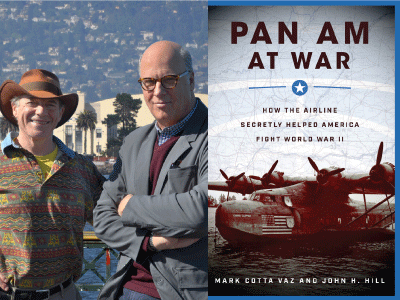 Award-winning writer Mark Cotta Vaz and Luis A. Turpen Aviation Museum curator John H. Hill discuss their absorbing collaborative work, Pan Am at War: How the Airline Secretly Helped America Fight World War II. Pan Am at War chronicles the airline's historic role in advancing aviation and serving America's national interest before and during World War II. From its inception, Pan American Airways operated as the "wings of democracy," spanning six continents and placing the country at the leading edge of international aviation. At the same time, it was clandestinely helping to fight America's wars. The daring flight that delivered uranium for the atomic bomb. Filled with larger-than-life characters, and revelations of the vision and technology it took to dominate the skies, Pan Am at War provides a gripping unknown history of the American Century.